Alex Markakis had been going to the China Lion on Market Street for 30 years and said he was disheartened when he heard it was closing its doors. But after seeing the décor and menu for the new Asian Garden, in the same location, Markakis said he’s no longer concerned. The Tangs, husband Wei, wife Ming and daughter Alicia, are old hands at running a restaurant and Alicia Tang said they are happy to be in Lynn. 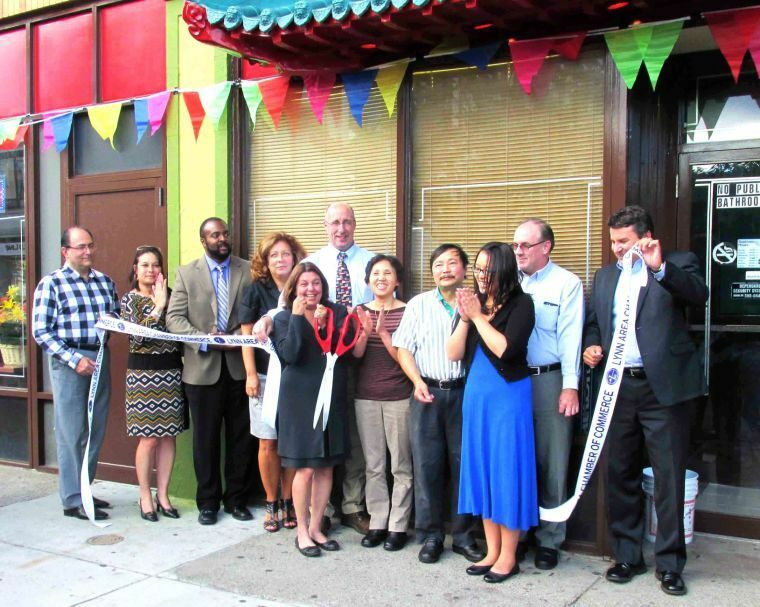 Shown from left at the ribbon cutting for the recent grand opening of Asian Garden on Market Street in Lynn, are, from left, Lynn Area Chamber of Commerce member Frank Scearbo, Mayoral Chief of Staff Jamie Cerulli, LACC member Jerome Thomas from Equitable Bank, Mary Jane Small from Lynn Economic Development and Industrial Corp., Lynn EDIC Executive Director James Cowdell, Mayor Judith Flanagan Kennedy (with scissors), Asian Garden owners Ming Tang, Wei Tang and Alicia Tang, LACC Ambassador Steve Shea and Community Development Director James Marsh. Tang said her family owned a restaurant in Falmouth but wanted to expand and began looking for the perfect spot. A friend told them the China Lion was available and Tang said once they saw it they knew it was just what they were looking for. “It’s near City Hall, the courthouse, schools, a lot of people walk by, it’s a perfect location,” she said. Tang said the family philosophy is simple, offer a good product with good customer service and people will come. “That is the key to a good business,” she said. To give the place a new vibe, Tang said they rehabbed nearly everything and modernized much of it. Gone are the deep red carpets and heavy artwork that adorn the more traditional Asian restaurants, in favor of simple clean walls, new wood floors, a long sleek banquet table in a small sectioned off dining room and a wraparound bar in the front room that is flanked by high top tables on one side and low tables with lounge style chairs on the other. The ceiling is gold and ornate, and the doorway into the dining room has hand carved trim, a nod to the family’s history, but Tang said everything else is new and fresh. “Even the bathrooms are brand new and handicap accessible,” she said. The menu has also been revamped. Diners will find traditional Chinese fare but they will also be able to try Thai and Korean dishes as well. Tang said she noticed when scouting the location that not a lot of restaurants in the area offered Thai or Korean food and she thought they could fill that niche. She also believes the prices offered are right on the mark and comparable to other Asian restaurants in the city. She wants people to be excited because she and her family are excited to be in Lynn, she said. After nearly nine months of work, “we are very happy to be open,” she said. Heather Scanlan is also very happy they are open. Like Markakis, Scanlan was a longtime regular of the China Lion.